I use a clear Tupperware tub to test all my rigs before I cast them out. I know a lot of people advocate testing in the margins but I feel that a clear tub is far better as it allows me to see how the rig is behaving. This is epically important to me as it allows me to see exactly how it will look when it is on the lake bed and make sure I have the correct counter weight when I am using a Pop up. 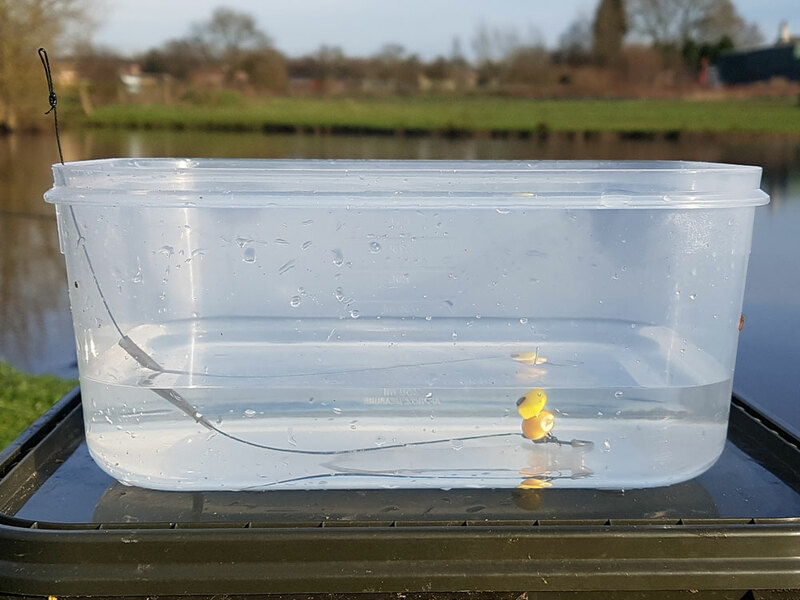 I also use the testing tub at home, much to Lucy’s annoyance, long before I am on the bank to test the buoyancy of my pop ups. Believe me not all pop ups are made the same, I test every set of pop ups and I test them for a fair amount of time. I test them attached to my usual Multi Rig set up and I need them to hold the rig up for at least 24 hours. But I really want them to last 48 hours, I check them every 10 to 12 hours and each time I check them I lift the rig up and drop it back in to emulate being picked up and rejected. The pop up must have enough buoyancy to reset the rig into the correct position. I know this sounds a bit over the top but I need to have confidence that everything is working as I want it. This is another one of those 1% items that goes into making a successful Carp angler. This entry was posted in rigs, tips and tagged carp fishing, rigs.